National Wildlife Refuge, Socorro County, NM. gray wolves has spread to Colorado and Utah. The Federal government proposed to release a subspecies of wolf in southern Utah and Colorado. This has raised concerns among local ranchers and the Utah Farm Bureau. 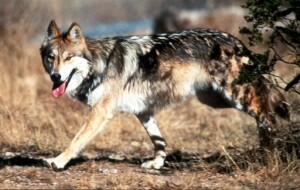 Conversely, wildlife advocates are fighting to introduce the Mexican gray wolf into Utah. The Mexican wolf is a threatened species found in the Southwest region of the United States. There are only 110 species left in the wild. The U.S. Fish and Wildlife Service has surveyed the region along southern Utah and believes the habitat is suitable for the reintroduction of Mexican gray wolves. Kirk Robinson, executive director of the Western Wildlife Conservancy, expressed his concerns about the Mexican wolf not being discussed during the legislative season. "Nobody is talking about reintroducing the Mexican wolf," Robinson said. "Our government officials are really upset about this. They don't want Mexican wolves or any other wolves for that matter. That is why there is such a big conflict." Robinson shed some light as to why southern Utah needs a wolf population. "Wolf populations will help control the number of deer and elk," Robinson said. "So those populations won't get larger." Robinson said a sub-population of the Mexican wolves will help boost the ecosystem in southern Utah by preying on old and sickly deer and elk, which will help with big game population control. Although wildlife advocates are making preparations for the reintroduction, not all Utahns are willing to welcome the Mexican wolf with open arms. Sterling Brown, vice president of the Utah Farm Bureau, expressed his concerns with the U.S. Fish and Wildlife Service's proposal. "(Mexican gray wolves) are not native to southern Utah," Brown said. "The Federal government has written a policy that an endangered species cannot be transported or transplanted in non-native areas. Yet the U.S Fish and Wildlife Services want to expand (Mexican gray wolf territory) into southern Utah. That's going against their own policy." Robinson retaliates that Utah cannot put up laws to abandon wolves from the state, especially if the species of wolf is critically endangered. Southern Utah thrives on an agricultural economy, with hundreds of ranchers owning generational ranches on lands. The rural economy is founded on agriculture and mining. Brown's primary concern is that the Mexican gray wolf would disrupt southern Utah's economic system. "You throw a non-native species in this economic environment and everything becomes disrupted and things begin to be difficult," Brown said. "There needs to be certainty." Yet Robinson feels certain Utahns want wolves. He mentioned a public survey conducted by Utah State University graduate Jeremy Bruskotter that shows different attitudes from Utah residents statewide. The survey shows that only 33.6 percent of southern Utah residents feel Utah is better off without wolves. However, without help from state government, the process for reintroducing wolves to Utah will take even longer. Robinson expressed his feelings on the public surveys. "Some people are sad that (there are no wolves in Utah)," Robinson said. "A lot of people want to have wolves (in Utah). If we let them return, we will do a right thing and feel good."